Historically informed notions of belonging in the Irish context have come to be perceived as inextricably intertwined with, among others, membership of the Catholic faith (Tracey 2000). In the periods prior to and post independence, this racialised Catholic Irishness has become institutionalised in Irish society (Fanning 2002; Garner 2009). In what follows, I will demonstrate the manner in which the collocation of Catholicism with Irish identity has resulted in exclusionary practices towards those who do not fit this idealised identity. Allen, C., & Nielsen, J. (2002). Summary Report on Islamophobia in the EU after 11 September 2001. http://fra.europa.eu/fraWebsite/attachments/Synthesis-report_en.pdf. Brady, T. (2014). Jihadi fighters risk losing their Irish passports. Irish Independent, 22 August 2014. http://www.independent.ie/irish-news/jihadi-fighters-risk-losing-their-irish-passports-30527620.html. Central Statistics Office. (2015) Census 2011 profile 7 religion, ethnicity and Irish Travellers – ethnic and cultural background in Ireland. http://www.cso.ie/en/census/census2011reports/census2011profile7religionethnicityandirishtravellers-ethnicandculturalbackgroundinireland/. Accessed 1 December 2015. Cullen, A. (2015) Watch: Anti-Islam group in clash with counter-protesters at mosque. Independent.ie, http://www.independent.ie/irish-news/news/watch-antiislam-group-in-clash-with-counterprotesters-at-mosque-30955812.html. Hickman, M., Thomas, L., Silvestri, S., & Nickels, H. (2011). 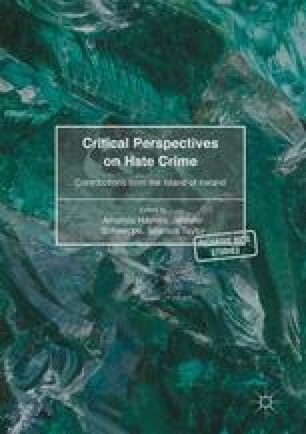 “Suspect communities?” Counter-terrorism policy, the press, and the impact on Irish and Muslim communities in Britain. London Metropolitan University. https://www.city.ac.uk/__data/assets/pdf_file/0005/96287/suspect-communities-report-july2011.pdf. Hosford, P. (2014). Racist graffiti painted outside immigrant council offices. http://www.thejournal.ie/graffiti-painted-across-from-immigrant-council-offices-1301926-Feb2014/. Islamic Foundation of Ireland. (2014). Who lives here belongs here [online]. Retrieved from http://www.islaminireland.com/news/who-lives-here-belongs-here/#Comment357. Kilpatrick, C., & Farrell, N. (2014). From the hills of Donegal to the battlefields of Syria, Irish Independent, 23 August 2014, http://www.independent.ie/world-news/middle-east/from-the-hills-of-donegal-to-the-battlefields-of-syria-30530095.html. Lucey, A. (2015). Irish anti-Islamic group protests mosque in Kerry. Irish Central, 10 July 2015. http://www.irishcentral.com/news/Irish-anti-Islamic-group-protests-mosque-in-Kerry.html. O’Carroll, S. (2013). Racist graffiti scrawled on walls during halal store ransacking. http://www.thejournal.ie/halal-store-trashed-graffiti-dublin-1171599-Nov2013/. O’Riordan, S. (2011). Cork city councillor calls for ban on burka and hoodies’, The Irish Examiner, 19 August 2011, http://www.irishexaminer.com/ireland/cork-city-councillor-calls-for-ban-on-burkas-and-hoodies-164769.html. Point, P. (2010). All Ireland Traveller health study: Our geels. http://www.paveepoint.ie/tempsite3/wp-content/uploads/2013/10/AITHS-Summary-of-Findings.pdf. Power, M. J., Haynes, A., & Devereux, E. (2012) From the mouths of Janus: Irish politicians’ constructions of transnational EU migrants in Ireland. http://www.dit.ie/icr/media/diticr/documents/1%20Power.pdf. Poynting, S., & Noble, G. (2004). Living with racism: The experience and reporting by Arab and Muslim Australians of discrimination, abuse and violence since 11 September 2001. Report to the Human Rights and Equal Opportunity Commission. http://www.stepone.org.au/media/1712/living%20with%20racism.pdf. Raidio Teilifís, É. (2013). Now it’s personal. http://www.rte.ie/tv/programmes/now_its_personal.html. Trust, R. (1997). Islamophobia: A challenge to us all. http://www.runnymedetrust.org/publications/17/32.html. YouTube (2015). Anti-Islam visit to Kilkenny Imam. https://www.youtube.com/watch?v=5b1UI2J3x70. Zelin, A., Rena, I.C.S.R., & Fellow, S.D. (2013). ICSR insight: Up to 11,000 foreign fighters in Syria; steep rise among Western Europeans. http://icsr.info/2013/12/icsr-insight-11000-foreign-fighters-syria-steep-rise-among-western-europeans/.